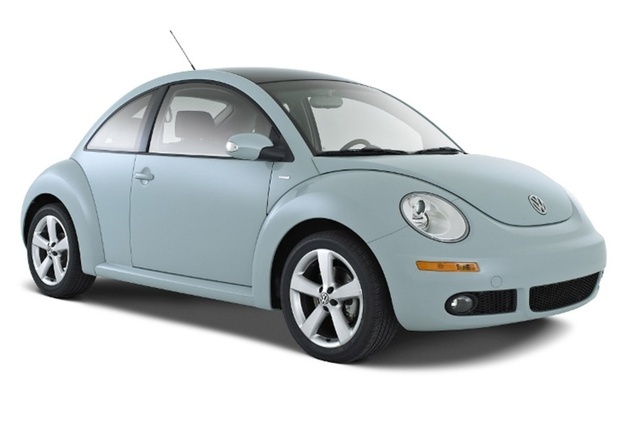 The 2010 Volkswagen Beetle 2.5L serves as the base trim for this model. The 2.5L is powered by a 2.5-liter, 150-horsepower inline five-cylinder engine mated to a five-speed manual transmission (a six-speed automatic is available) that gets 20 city/28 highway mpg. The Beetle 2.5L's exterior features include heated windshield-washer nozzles, heated body-color mirrors with integrated turn signals, daytime running lights, projector lens halogen headlamps, dual-tone horn, body-color grille, and door handles, mid-mounted third stop lamp, and anti-intrusion door beams. The 2.5L's interior features include CFC-free air conditioning, cruise control, power windows, heated front seats, a leather-wrapped steering wheel, brake handle, and shift knob, anti-theft system with vehicle immobilizer, brake-pad wear indicator, tire pressure monitoring system, two folding keys with radio-frequency remote transmitter, power locks with automatic locking feature, two SAE power outlets, fully reclining front seats with manual height and angle adjustments, a one-piece folding rear seat, V-Tex seat trim, fully carpeted luggage compartment, and an in-dash single-CD stereo with MP3 capability, auxiliary input jack, and SIRIUS Satellite Radio. The 2010 Volkswagen Beetle 2.5L Convertible shares all powertrain, performance, interior, and exterior features with the 2.5L trim, but replaces the hard top with a soft top and is available only with a six-speed automatic transmission (the hard top comes standard with a five-speed manual or the optional automatic transmission) and gets 20 city/28 highway mpg. The power-folding soft top comes in either black or white with a color-keyed boot. Unique 17-inch wheels are a factory option for the Convertible, which costs $8,000 more than the hard-top trim.